25-Apr-2008 -- This is the 22nd of a series of 83 confluence visits during our voyage from Nigeria to Europe and back to Nigeria around the entire African continent. It all started on 28 January at 11N 5E. Story continues from 9N 9W. The road from Nzérékoré to Macenta is bypassing the confluence 8N 9W. The closest approach is 1.6 km. Our map that we used, however, reflected it much closer. There was a small path leading into the direction of the Confluence, but it ended after a couple of hundred meters. 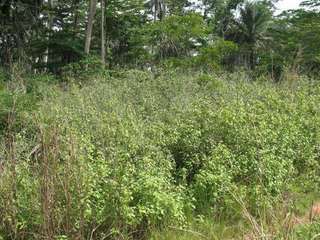 There was such a lot of undergrowth that it was not possible for us to continue. It was the beginning of the raining season and in the late afternoon there were daily showers. On the few hundred meters we walked the path towards the Confluence, a 2-meter long black cobra crossed our path in front of us. All this discouraged us to continue and very frustrated, we abandoned the idea to get to the Confluence.